1st - Charles de Foucauld, Hermit, 1916. Firstly a Trappist monk, but seeking a more austere life joined Poor Clares in Jerusalem. Last years of his life spent as a hermit in Algeria. His life & example inspired others to live according to his Rule, & his community became known as Little Brothers of Jesus in 1945. 2nd -. Ralph Sherwin, Priest & Martyr, 1581. After ordination returned to England to serve fellow Catholics. Arrested whilst preaching, and suffered the same terrible death as so many contemporary Catholics. - St. Bibiana, Virgin & Martyr, 363. Suffered a horrible death in the time of Julian the Apostate. She was tied to a pillar and scourged with heavy blows until she expired. 3rd - St. Francis Xavier, Miss. & Ap. of the Indies, 1552. One of the original Jesuits. Preached the gospel in the East Indies and Orient. Best known today for his prayer which begins, "Not with the hope of gaining aught,/Not seeking a reward,/ But as Thou Thyself hast loved me,/ O ever loving Lord." - St. Cassian, Martyr, 298. When St. Marcellus was being tried in the court in Tangier, Cassian, the scribe threw his sytlus in disgust over the injust proceedings. He too was sentenced to death and died a Christian martyr. - SS. Claudius, Hilaria & Co.Martyr, c.284. Claudius and other Roman soldiers were converted to Christianity as they were interrogating Christians. Claudius wife, Hilaria was also converted with her sons. Claudius and the boys with the other soldiers all executed. Hilaria was after she was found grieving at the gravside. - St. Attala, Virgin & Religious,741. Raised by her aunt, St. Odilia, abbess of Hohenburg. 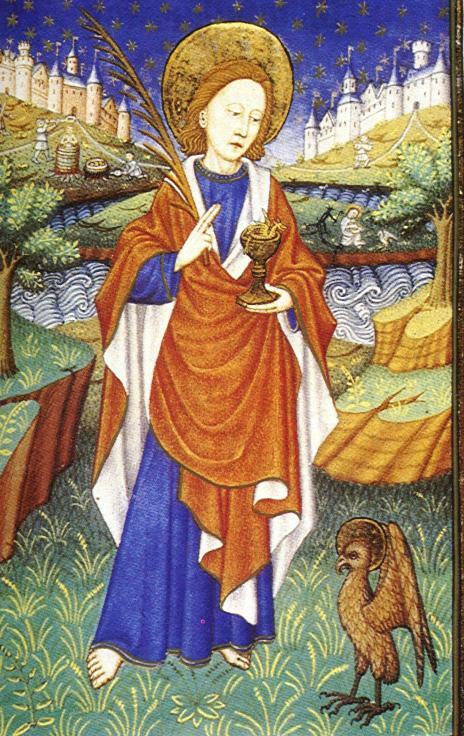 Attala became abbess of convent of St. Stephen in Stradbourg, where she governed got 20 years in humility and charity. - St. Eloquis, Abbot, 7thC. A native of Ireland who went to France where he and St. fursey founded the monastery of Lagny. Became the 2nd abbot, but a revolt of the monks against him forved hism to withdraw to Grigny. Here he served under the local bishop. - St. Anthemius, Bishop, 8thC. Bishop of Poitiers. Accompanied Charlemgane as his chaplain when he invaded Spain agaionst the Moors.Was killed during one of the battles. 4th - St. John of Damascus, Religious & Teacher, c.749. A prolific writer of theological works and of hymns. His De Fide Orthodxa, a summary of the teachings of the Gk. Fathers was immensely influential in both W. & E. Churches. -Nicholas Ferrar, Deacon, 1637. Founder of the Community at Little Gidding. He inspired the whole Ferrar family to live a life of regular daily and nightly prayer in their chapel and to do charitable works in their village. - St. Anno, Bishop, 1073. As archbishop of Cologne, he carried out reforms in the monasteries. Although involved in mattersof State, was a very prayerful priest, and spent his last days in severe penanc at the monastery of Siegburg. - St. Bernard of Parma, Bishop, 1133. After a vision he had, he made arrangements for his widowed mother and sister so he could enter the monastic life. He later became abbot general of the Vallombrosian Order. Consecrated bishop to the see of of Parma. Promoted the reforms of Gregory VII. 5th - St. Clement of Alexandria, Priest, c.210. Catechist at the famous school in Alexandria. One of the Fathers of the Church. - St. John Almond, Priest & Martyr, 1612. After his ordination in 1598 returned to England . Gave 10 years of ministry before being arrested and consequently executed. - St. Sigiramnus, Abbot, c.655. Determined to live the religious life, he broke off his betrothal and retired from the court of Clotaire II. In the church of St. Martin of Tours, he took a vow to consecrate his life to God. He gave away his inheritance, and made a pilgrimage to Rome. On return he settled in Meobecq where he erected a hermitage which became a monastery. He founded a second monastery at Longoretum where he was abbot. 6th - St. Nicholas, Bp. of Myra, c.326. One of the patrons of Russia. His providing 3 girls with dowries to save them from a life of prostitution is the basis for giving gifts on this day in Holland, and for much of the western Church on 25th Dec.
- St. Asella, Virgin, c.410. One of the women in Rome living under the spiritual direction of Jerome. Took the vow of virginity when 10. Two years later she withdrew from the world and lived an extraordianry ascetic life. Spent much of her time on her knees praying and reciting the psalms. Jerome saw her as an "illustrious model of chastity and virginity." 7th - St. Ambrose, Bp. of Milan, 397. Great teacher and preacher of the Scriptures & Faith. 1st to introduce hymns into worship, and wrote several hymns himself. Tradition has it that he and Augustine responsible for the Te Deum. One of the 4 Latin Fathers. - St. Agathhio, Martyr, 251. During the Decian persecution in egypt, he intervened to defend the bodies of martyrs mocked by others. As a consequence he was beheaded for professing the Christian faith. 8th Conception of the Blessed Virgin Mary. This feast dates back to the 7thC. and marks the dawn of the New Covenant. 9th - St. Peter Fourier, Augustinian & Educator, 1640. Established the Congregation of notre Dame to educate young girls. - St. Juan Diego, humble & holy man to whom Our lady appeared as he walked to Mass on this day, 1531 with a message to tell the bishop to build a church upon this site. Roses growing in the snow on the hilltop was proof of her visit for the bishop that Juan bought him. 10th - St. Gregory III, Pope, 741. Appointed Pope by popular acclaim in the midst of the funeral procession for Gregory II. Stood up to the Emperor, Leo II who was attacking the veneration of icons. A very holy man. - St. John Roberts, Religious & Martyr, 1610. Joined the Benedictine order, and was ordained. Returned to England many times but expelled. Founded the Englsih Benedictine monastery in Douai, Now Downside Abbey. Returned to England to adminsiter to victims of the plague. Arrested whilst saying Mass, and subsequently condmened to a brutal death. - St. Swithin Wells, Martyr, 1591. One of many Catholics hounded by Elizabethan authorites in London. who was eventually arrested and brutally tortured before an agonising death. 11th - St. Damasus, Confessor & Pope, 384. During his pontificate the Emperor, Theodosius proclaimed Christianity as the official religion of the Roman Empire. Commissioned Jerome to produce a revised Latin text of the Bible. Energetic in combating heresies. 12th - Jane Frances de Chantal, Foundress of the Order of the Visitation, 1641. Placed herself under the direction of Francis de Sales, the result of which she founded the first of many convents for women unsuited to severe ascetic life. Vincent de Paul described here as "one of the holiest people I have ever met on this earth." - Our Lady of Guadalupe, Patron of the Americas. Celebrates Mary appearing before the humble Juan Diego as a beautiful Aztec princess speaking his own native language. 13th - St. Lucy, Martyr, 304. Tradition tells us that she gave away her goods to the poor and her angry betrothed betrayed her to authorities. As her name means "light" and as her day falls at the shortest time of daylight, she has become associated with the true Light that overcomes all darkness. - St. Odilia, Religious, c. 720. Born blind she miraculously received her sight when baptised.by St. Erhard who had had a vision of her in the convent in Baume. Later in life her father gave his castle to her, which became the convent of Hohenburg with herself as abbess..
14th - St. John of the Cross, Mystic, 1591. Closely associated with Teresa of Avila & the reformed Carmelite Order. 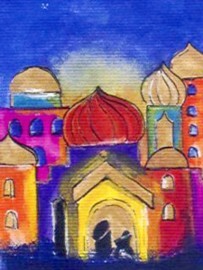 His labour brought him into conflict with religious authorities & imprisonment. This produced some of his finest writings. Best known for his description of the "dark night" of the soul as the purifier. - St. Spiridion, Bishop, c. 348. During the persecution of Galerius, suffered the loss of his right eye, the mutilation of his left hand, and consigned to hard labour. Attended the Council of Nicea. At the Council oif Sardica in 347 spoke in defence of St. Athanasius. 15th - St. Offa of Essex, King & Monk, c. 709. Became king of East Saxons in 707, but not long afterwards abdicated and went to Rome to become a monk. Died shortly afterwards. 16th - St . Bean, Early Irish saint of Wexford. - St. Ado. Bishop, 875. A monastic teacher at abbey of Prum, but became a victim of jealousy from fellow monks which led to his expulsion. Made a pilgrimage to Rome. En route visited Ravenna where he saw a. manuscript of martyrology. This led to making his own. In 860 became archbishop of Vienne. A zealous pastor who expected his priests to be also. - St. Olympias. Deaconness, 408. A great supporter & friend of John Chrysostom. With other women founded a community next to John's episcopal residence. When he was expelled, the community folded and she also went into exile. - St. Wivina, Religious, 1170. Resolved to model her life on Abraham and to leave home.. A yooung man, Richard has sought her hand in marriage, and when she refused him, became desperately ill. She prayed & fasted for his recovery. On being restored to health he rseolved to imitate Wivina's holy life. At 23 she became a hermit near Brussels.with a likeminded woman. Eventually their hermitage became a convent of Grand Bigard, with Wivina as 1st abbess. - St. Sturmi, Abbot, 779. After being ordained served as a missionary in Westphalia. After 3 years became a hermit, firstnear Hersfeld and then at Fulda where he founded a monastery in 744 with support of St. Boniface. Traveled to Monte Cassino to study the Benedictine Rule for his monastery at Fulda. Later years troubled with a dispute with the bishop of Mainze, St. Lull. -St. Flannan, Bishop, c.7thC. Associated with places in both Ireland and Scotland. Abbot at monastery of Killaloe, and in Scotland Flannan islands named after him, and on of these is a ruined chapel dedicated to him. - St. Winebald, Abbot, 761. Ordained by Boniface, and his brother Willibald when he became bishop of Eichstatt, asked him to be come abbot of a double monastery in Heidenheim. A great issionary as was all his family. - St. Bodagisl, Monk, 588.Agreed with his wife Oda after the birth of their son to live a chaste life. He became a hermit in the wilderness, and then founded a monastery. Oda also founded a convent. Their son Arnulf became bishop of Metz. - St. Flavitus, Priest & Hermit, 630. Taken as prisoner of war from his home in Italy to France. After his release he and his wife separated to live celibate lives. After his ordination built an oratory in Marcilly where he lived as a hermit. - SS. Quintus, Simplicius & Co. Martyrs, c.251. Under the Decian edict all bishops & priests were to be executed. On this day over 30 suffered martyrdom in various places of North Africa. 19th - O Radix Jesse. -St. Anastasius I, Pope, 401. To prevent the spread of heresy he ordered that any priest from abroad seeking to serve under Roman jurisdiction had to obtain a certificate signed by five bishops. - St. Nemesion, Martyr, 250. Before the prefect of Egypt charged with being a Christian. Scourged twice as much as an ordinary criminal, and executed by burning. - St. Dominic of Silos, Abbot, 1073. After exile from Navarre was welcomed by Ferdinand I of Old Castile who gave him the monastery of St. Sebastian at Silos. In this ruined building he rebuilt the monastery under Cluniac ideals. A monk of great holiness who attracted many to this monastery. - St. Ammon & Companions, Martyrs, 250. In Alexandria, before Roman authorities Christians were being questioned about their faith. When one began to falter some of the soldiers began to gesticulate to him.Upon quetioning their motives, the five soldiers, Amnon, Zeno, Ptomely, Ingenes and Theophilus all stepped forward. They with the other Christians all suffered martyrdom. - St. Ursicinus, Abbot, 625. A disciple of St. Columban. Accompanied him to Metz, Germany from Luxeil, France. Later on Ursicunus founded a monastery in Switzerlans following the rule of Columban. From here he evangelised the native pagans. Noted for his holiness and miracles. Swiss town of Saint Ursanne is named after him. - St. Peter Canisius, Jesuit, Writer & Educator, 1597. His catechism became the model for all others after it. His most important achievement was reforming and nourishing the church in Vienna. Later was appointed head of the Jesuit College in Prague which became famous for its religious & academic standards. - St. Peter Thi, Priest & Martyr, 1839. A victim of the persecution in Vietnam by King Mih Mang. Many Christians expelled, and native Chritians ordered to renounce their Catholic faith. Amongst those whno refused was the 76 Peter Thi who was beheaded. - St. Albert Chmielkowski, Religious, 1916. Fought in Polish resistance against the Russian occupation. A successful artist before entering the Jesuits. Left early because of poor health and joined the Third order of Franciscans. In 1888 founded a new congregation to serve the homeless, the Brothers of the Third Order of St. Francis, Servants of the Poor. Took the religious name of Albert. In 1891 founded the corresponding women's congregation. These became known as "Albertines". When he died there were 31 shelters in Poland. - SS. Chaeremon, Ischyrion & Co. Martyrs, 250. These suffered death in Egypt under Decian persecution. - St. Ernan, Religious, c.640. A nephew of St. olumba who accompanied him to Iona. After Columba's death returned to Ireland, and founded the monastery of Drumhome in Donegal. - St. Thorlac, Bishop, 1193. Iceland's first saint. In 1168 was bequeathed a large farm on which he founded a community of Augustinian friars with himself as abbot and his mother as housekeeper. Ten years later consecrated bishop of Skalholt and began various reforms amongst the clergy. 24th - Christmass Eve. "Let Mary's spirit be in each to rejoice in the Lord. Christ has only one mother in the flesh, but we all bring forth Christ in faith." (St. Ambrose). "For while peaceful silence enwrapped all things, And night was in mid course, Thine all-powerful Word leaped from heaven out of thy royal throne." (Wis.18.14-5). 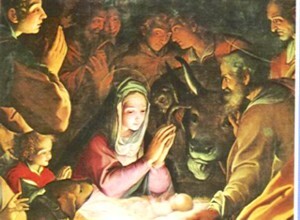 25th -The Nativity of our Lord Jesus Christ "Awake! For your sake God was made man! 'Awake O sleeper, and arise from the dead, and Christ shall give you light.' For your sake, I say, God was made man." (St. Augustine). 26th - St. Stephen, Deacon & 1st Martyr. Luke's description of him has direct parallels to Christ, e.g being filled with the Holy Spirit, seeing the Son of God at the right hand of God, commending his spirit into God's care and praying forgiveness for his slayers. 27th - St. John, Apostle & Evangelist. "The disciple whom Jesus loved," and the last apostle to die, of old age in Ephesus. John proclaims Jesus as "the Word made flesh" in that remarkable prologue reminiscent of Genesis 1. 28th - Holy Innocents. After the Magi's visit seeking the one "who has been born king of the Jews", all children under two were ordered by Herod to be slaughtered. Reminiscent of the slaughter after Moses' birth. 29th - St. Thomas à Becket, Archbishop & Martyr. After appointment as A'bp. of Cantaur Thomas fell out with his friend Henry II as he championed the cause of the Church. Spent most of his time in exile, and on return was hunted down and brutally murdered in his cathedral on this day in 1170. - St. Egwin, Bishop, 717. Bishop of Worcester & founder of Evesham abbey. - St. Anysius, Bishop, c.410 Defender of John Chrysostom as bishop of Thessalonica. He & other Macedonian bishops suspended the heretical Bonosus who questioned the divinity of Christ and perpetual virginity of Mary. - St. Eugene of Milan, Bishop, 9thC. A learned and pious bishop who defended the local Ambrosian rite when Charlemagne was pressing for its abolition. After both this sacramentary and the Roman were placed side by side on the altar in St.Peter's basilica, it was discovered that God did not want to abolish either rite. So the Ambrosian rite has survived even to this day. - St. Sylvester I Bishop of Rome, 335. Dedicated the church of the Lateran to the Redeeming Saviour after the end of persecution. This became the Mother Church, and he was the first bishop to live in the Lateran Palace as the official residence of the Bishop ofRome. Buried in a church which he built at the cemetry of Priscilla. - St. Columba of Sens, Virgin & Martyr, c.274. Baptised when 16 years in Vienne. When Aurelian visited the city of Sens, he ordered Columba and her companions to be put to death for their faith. It was at the monastery of St. Columba, Sens, that Thomas Becket spent part of his exile. - St. Mary of Succor, Religious, 1281. Born into a wealthy family, she was greatly moved by a sermon by the local prior of Barcelona's monaastery. Took a vow of virginity, and distributed her inheritance amongst the poor. She and 2 widows founded a 3rd order of the Mercedarians. They embarked on alife of prayer and penance for anyone in need. John Wyclif, Reformer, 1384. Amongst other ecclesiastic matters, worked towards having the Bible printed "in that language which is best known" by the local people. Ember Days are observed this month after St. Lucy's Day in the Anglican Communion still. THE JOHANNINE GOSPEL UNFOLDS THE GREAT MYSTERY OF THE INCARNATION IN ITS PROLOGUE. SO IT IS VERY APPROPRIATE TO CELEBRATE THIS IN THE OCTAVE OF CHRISTMASS, ON THE 27TH.